With An Army Of Vaccinators, India Subdues Polio : Shots - Health News Despite poverty and poor sanitation, the world's second-most populous country is eradicating polio, which has afflicted India for millennia. Health officials hope India's successful war plan against polio will serve as inspiration for its archrival, Pakistan, in its own fight against the disease. 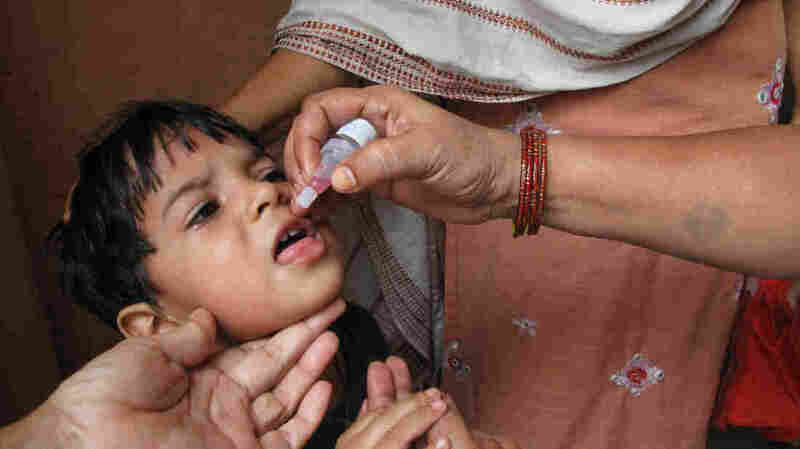 An Indian child receives the oral polio vaccine. Twice a year, an army of 2 million volunteers fans out across India to administer the vaccine. India has not reported a single case of polio in more than a year-and-a-half. All this week, we've been examining the world's last remaining pockets of polio, a disease for which there is no cure. India marked a milestone when the World Health Organization struck it from the list of polio-endemic countries in February after no new cases were reported for more than a year. From Delhi, NPR's Julie McCarthy reports on how, despite poverty and poor sanitation, the world's second-most populous country is eradicating the disease. The humanity of India washes up at its train stations. Passengers sprawling among vagrants wait for trains, while sweepers halfheartedly shuffle brooms in the heat. It's Sunday, Day 1 of Immunization Week. During national campaigns, which occur twice a year, 2 million volunteers fan out to India's train stations, bus depots, temples, churches and mosques, armed with vials of polio vaccine. Checking progress at a city slum, Delhi's Polio Eradication Program chief, Dr. C.M. Khanijo, says the vaccine must be kept at around 35 degrees Fahrenheit — even when the temperature outside is 109 degrees. "The quality of the vaccine remains better if it is maintained in the cold chain," he says. "And the cold chain is maintained by keeping ice or ice packs." Khanijo says that in just 30 minutes, enough vials to cover a large area of Delhi's old, walled city are distributed and in place. By 9 a.m., an army of vaccinators is dropping medicine into little mouths. Families bring their squirming children to the booths, where they are given oral polio drops, containing a weakened form of the wild polio virus, which only humans carry. India has 175 million children aged 5 and younger, and all of them are tiny targets in this massive national immunization project that, since January 2011, has made India free of a disease that has afflicted it for millennia. It must remain polio-free for three years before the WHO will certify that India has eradicated polio. 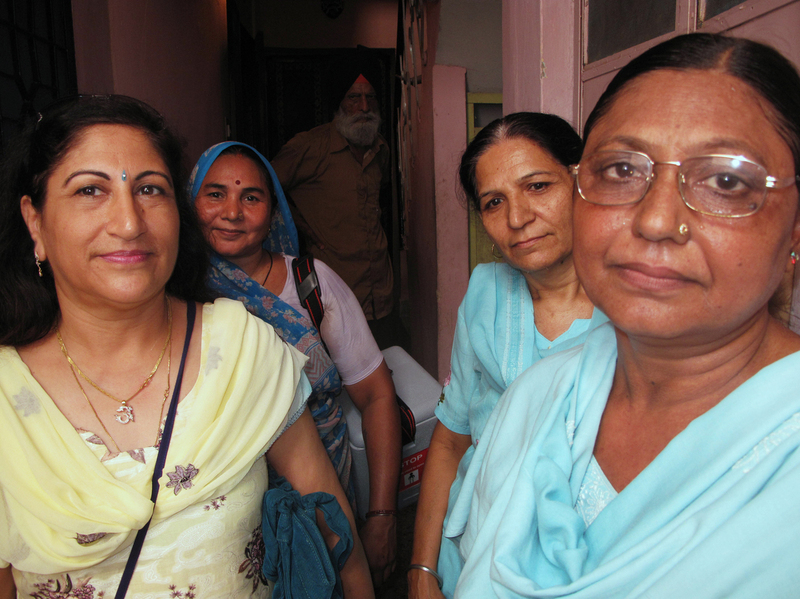 Dr. Kiran Kathuria (left) and veteran volunteer Santosh Sharma (front right) make the rounds with a team of vaccinators in Nehru Nagar, a middle-class area of Delhi. India's nationwide polio eradication program, begun in 1995, was modeled after Delhi's. "This is kind of a mission. But ultimately the purpose is that we need to reach each and every child," says Dr. Ajay Khera, the deputy commissioner of India's Ministry of Health and Family Welfare, who directs the country's polio eradication program. "In 1995, when we started the program, we used to get roughly around 50,000 polio cases every year. And every village, everywhere, people used to find a polio child," Khera says. "So people ... imagine kind of a disabled child, and nobody wants that disabled child to be there in the community." Trucks blast messages encouraging families to vaccinate their children, part of India's mass public-awareness campaign. The nation's polio chief says the aim is to vaccinate as many children as possible on Sunday, the first day of the campaign, and then have vaccinators go house to house for the next five days. Dr. Kiran Kathuria oversees 127 teams that go house to house in central Delhi during National Immunization Week and during supplementary or "Sub-National" weeks. The poorer, less developed north of India, which includes Delhi, is more prone to polio than the richer south, and so vaccination weeks are more frequent there. Kathuria recalls working as a young doctor in the country's disease-afflicted slums. The suffering she saw made eradicating polio her passion. "Every second house had a ... polio-affected child. They were roaming around on the road, limping legs — I have seen lots of deaths due to polio," says Kathuria, who has been working against the disease since 1986. Back then she mapped the slums for the vaccinators, noting down any "landmark" she could find — from temples to pigsties. "I had put in my map that from [this] pigsty to this mosque, the team will travel and cover 300 houses in two days. That's how I made my maps. That was the beginning," she says with a laugh. Today, Kathuria calls herself a "general" in a war on polio. One of the biggest worries health officials have is that the virus will jump across the border from Pakistan, where the disease is endemic. Extending her war analogy, Kathuria compares India's polio campaign to the 1999 fighting between India and Pakistan in Kashmir. "That time we did not allow [the] Pakistani army [into India]. This time we will not allow [a] Pakistan virus to come to India. In fact, I call all my team members, I call them soldiers," she says. Her troops — mainly women — cover a middle-class district where families have just one or two children, and she closely monitors their work. Santosh Sharma, a stout 52 year old, has gone door to door in Delhi since the program began in the 1990s. "That time we did not allow the Pakistani army [into India]. This time we will not allow a Pakistan virus to come to India." At this door she's told that the mother of the house is bathing. Santosh says she'll be back and moves to the next apartment. This immunization in September was the sixth this year for Delhi, and like most of the ones preceding it, Santosh finds 4-year-old Jasmit Singh at home with his mother, Rupinder. When Rupinder says her child was not vaccinated Sunday, the veteran volunteer reaches for the vaccine. Santosh has administered many of the polio drops young Jasmit has had, which amount to dozens over the years. Kathuria translates for Rupinder, saying the mother is proud that India is now gaining a good name in the world because it is polio-free. Kathuria translates for Rupinder, saying the mother is proud that India is now gaining a good name in the world because it is polio-free. Santosh, a foot soldier in that effort, interjects: "A dangerous disease is being thrown out of the country. A dangerous disease attacking our children is being eradicated." The Bill and Melinda Gates Foundation has advised India's polio program, providing money and expertise. (The foundation also supports NPR.) Bill Gates notes that with India's success, the world has never been closer to eradicating polio, and he says that the remaining hot spots should draw on India's experience. "India's success is really phenomenal," Gates says. "You probably would've guessed they would be the toughest country because of size, the number of kids who move around, the sanitation challenges up in the north, migratory populations. And so absolutely, the lessons from India can now be applied in the two toughest countries that remain — Pakistan in Asia and Nigeria in Africa." When a Pakistani delegation traveled to India this summer to see how its archrival had defeated polio, it saw a level of detail and logistics it had not seen before. The presence of Pakistanis in India usually sparks a media buzz, and this was no exception. When a zealous minder steps in to end an impromptu news conference, the Pakistani delegation leader, Shahnaz Wazir Ali, gently brushes him aside. "We appreciate what you are doing," Shahnaz Wazir Ali tells him before turning back to the reporters. "We have also greatly appreciated the monitoring system that [the Indians] have. Monitoring and monitoring of monitors. And the surveillance system." It is polio as diplomacy: two foes that have fought three wars finding new common ground. Michael Galway, Gates Foundation senior program officer, says bridging India and Pakistan over polio knits together not just program strategies but the chance to seize a historic moment for global health. "Polio eradication is not going ... to keep coming back as many different opportunities. This is our time. The world has only ever really gotten rid of one disease that affects human beings, and that's smallpox," he says. Back in her clinic, Dr. Kathuria expresses the belief that India's success will spur Pakistan. "I'm sure Pakistan will have the courage that they can eradicate polio, after seeing us," she says. "'If India can do it, why can't we?' I'm sure they will have that feeling."